Visiting Brazil with plastic surgeon Dr. Alan Landecker in his Sao Paulo clinic. That's interesting: In 2005, Alan Landecker, M.D. specialized in primary and secondary rhinoplasty at the University of Texas Southwestern at Dallas, Texas, USA, under Jack P. Gunter, M.D. and Rod J. Rohrich, M.D. For a period of 2 years, he was part of the Adjunct Faculty at the world-renowned Dallas Rhinoplasty Symposium and participated actively in the production of the second edition of the Dallas Rhinoplasty: Nasal Surgery by the Masters book. This book is currently the world´s best-seller in rhinoplasty. Brazil has some of the busiest plastic surgeons anywhere in the world and it's not uncommon to find those who have been trained in the US. When did you decide to specialize in plastic surgery? The attraction began during medical school, when I rotated in the Plastic Surgery Department. The precision, difficulty, and level of detail of the operations enchanted me. However, I believe that an important personality trait (visual attraction to beautiful things) contributed significantly. Can you tell us more about your clinic and how your staff operates it? The clinic offers last generation plastic surgery and cosmetic procedures that can be surgical or non-surgical to all age groups. Some of the latter include laser, skin treatments, and postoperative physiotherapy. The clinic is located in one of the most sophisticated areas in São Paulo and is run by professional managers. Most remarkable 'inside' the clinic is the contemporary architecture and interior design, offering patients a unique experience. The clinic offers IPL for hair removal, dark circles around the eyes, and some vascular lesions. We also have diode laser machines for rejuvenation and hair removal. Our newest machine is a radiofrequency device that is combined with electromagnetic energy. This kind of machine is very popular because splendid body contour is a priority for both men and women in Brazil. So far all of them have worked well for us. How are you finding staff? We've had some real issues with staff and due to past problems, we currently hire using only professional headhunters. Although more costly, this increases the chances of getting it right the first time! All staff have top class working conditions and receive a fixed salary plus bonuses depending on how well they perform. The secret is keeping them motivated! How do you market your clinic? In terms of marketing, the best is always to do a good job. In other words, the most solid marketing consists of word-of-mouth referrals. Complementary strategies should include a good website with SEO, use of social media, internal programs, and good exposure in the press. If all these are well structured, precise, and especially ethical, good results are inevitable. What treatments or services are most profitable for you? Plastic surgical procedures are the most profitable, followed by Botulinum toxin (Botox) and dermal fillers. We are currently developing a high-end aesthetic center to give patients a more complete type of treatment. What have you learned about practicing cosmetic medicine? What stories can you tell? The most common situations involve patients who bring tons of photographs of their noses into the consultation. They flog themselves trying to find minute imperfections which are normally invisible to most of us. What advice would you give to other physicians? Based on my experience, it is very important to get the best training possible and preferably in something that no other surgeon performs. That will necessarily include tremendous dedication and inevitable sacrifices but you just can't succeed if you only do what everyone else does and you don't have a reputation for being the best at something specific. Physicians must always be ethical and honest, keeping in mind that the most important outcome is patient satisfaction. In other words, never make decisions based on financial factors instead of doing what is best for the patient. 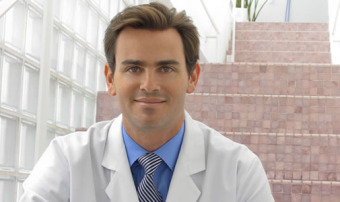 About: Alan Landecker, M.D. is a member of the Brazilian Society of Plastic Surgery and the the prestigious International Society of Aesthetic Plastic Surgery (ISAPS). Dr. Landecker obtained his medical degree and general surgery training at the University of São Paulo Medical School, Brazil. He was then trained in plastic surgery at the Pontifical Catholic University of Rio de Janeiro and the Ivo Pitanguy Clinic, where he worked directly with Professor Ivo Pitanguy for 3 years. After passing the ECFMG/USMLE examinations, Alan Landecker, M.D., spent a total of 2 years refining his plastic surgical training in the USA. During this period, he participated in clinical rotations, Research Fellowships, and Clinical Fellowships with some of the country's best surgeons at the Universities of Miami, Alabama at Birmingham (UAB), Pittsburgh, New York (NYU) and Texas Southwestern.